Major General Basilio Valdes was born on July 10, 1892 and died on January 26, 1970. He served as Chief of Staff and Secretary of National Defense of the Philippines from December 23, 1941 to February 6, 1945. He was initially in the field of medicine and studied at the University of Santo Tomas. In the First World War, he taught at the University of Philippines and then later on left for Europe to become a surgeon. In Paris, he was appointed Chief Surgeon of the Anglo-French Military Hospital. After returning to the Philippines in 1919, he gradually went up the medical hierarchy by going from Medical Inspector to Lieutenant Colonel and Chief Surgeon. The President at the time, Manuel Quezon, appointed him Brigadier General in 1934. Valdes also cared for Quezon by being his personal physician. He was the first of Chief of Staff of the Armed Forces in 1939. In the outbreak of World War II, he attended to many of those wounded by air raids. October 20th, 1944: Wading ashore Leyte. Valdes arrived at Leyte in this historic landing alongside President Osmeña, General MacArthur, General Carlos P. Romulo, and many other significant officers. 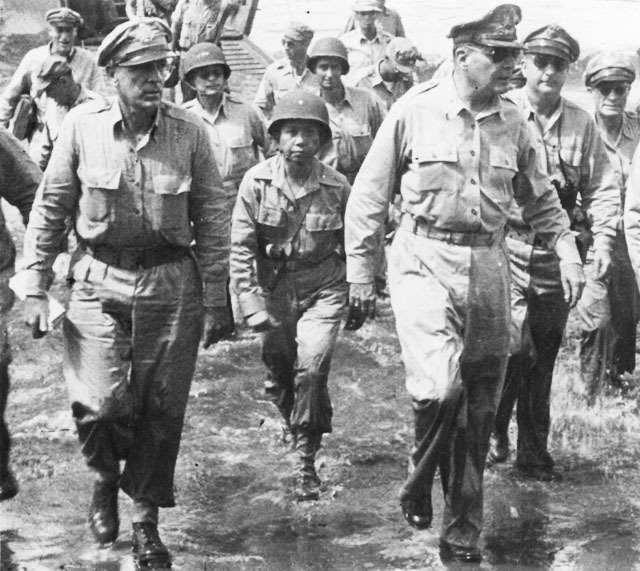 The return of General MacArthur to the Philippines gave the people hope in overcoming imperial Japan. The Battle of Leyte Gulf was crucial in the Philippine Liberation Campaign. October 23rd, 1944: Leyte Liberation ceremony. It was here in Tacloban that MacArthur read out a proclamation deeming laws set up by Japan invalid,. President Osmena then replaced those laws by those of the Commonwealth government. November 1941: Valdes in his office. Valdes established the Philippine Civil Affairs Unit (PCAU) in the wake of the liberation of Manila. These provided food distribution and medical relief throughout the provinces. These hospitals continued to thrive even after the war. I was first drawn into researching this general due to my own cultural heritage. I was very surprised to find a Filipino’s signature on the documents since all the other generals are either American or European. From what I've come to learn, Valdes was a well respected general and considered one of the top doctors in the Philippines of his time. His duty was with the people and was highly dedicated to fighting for his country. With this and the utilization of his strong medical skills, Valdes demonstrated great leadership in the midst of war and turmoil. This page provides Valdes’ own personal account of events in World War II and his life from 1942-1946.